The Tim Tam (from Australia) is Arnott's Biscuits' contribution to culinary excellence. It provides a fine balance between crispness and chocolaty goodness, not unlike a Coffee Crisp (from Canada). 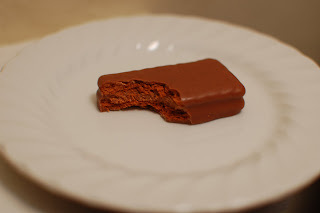 A Tim Tam Slam involves attempting to slurp hot tea or coffee through a Tim Tam. One must first nibble off the opposing corners to provide an entry point to the interior. It is challenging to succeed at this before the biscuit disintegrates. I AM HUNGRY FOR THIS TREAT.